The Bannockburn Centre have unveiled The Battle Game,, which will allow visitors to lead a medieval army in 3D. Visitors will have control of soldiers from the armies of Robert the Bruce and Edward II, who fought in 1314. Created by the National Trust for Scotland and Historic Scotland, the Center opens on March 1, 2014. The 700th anniversary of the battle will be marked on June 23 and 24. Each visit will culminate in The Battle Game, where you will be allocated an army division which appears on a massive 3D map of the Stirling landscape, giving a birds-eye view of the battle. This entry was posted in Travel in Scotland on January 31, 2014 by Camilla Hellman. 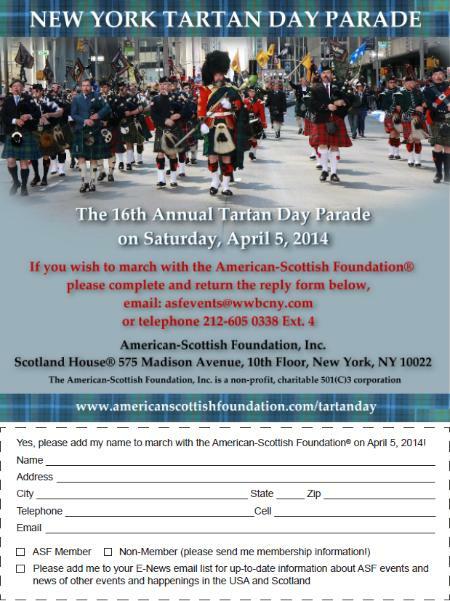 Join us to march in the 16th NEW YORK TARTAN DAY PARADE on April 5, 2014! If you do not have a group to march with, be our guests! The Parade starts at 2.00pm on April 5 at W 45th Street and marches up 6th Avenue to 55th Street. This entry was posted in ASF Events, Scotland-Tartan Week on January 31, 2014 by Camilla Hellman. New Members of 2013 and 2014 are invited as our guests! Tickets are $45 for Members and Guests. And if you are not yet a Member and Join Now your evening is part of your new membership…. To sign up as a New Member and join as our guest on February 25, click here to sign up online or complete your application using using this form. Existing Members who prefer to book for the evening by mail may also use the form. This entry was posted in ASF Events on January 31, 2014 by Camilla Hellman. For the next two weeks Robert Burns will be celebrated around the world in words and music. 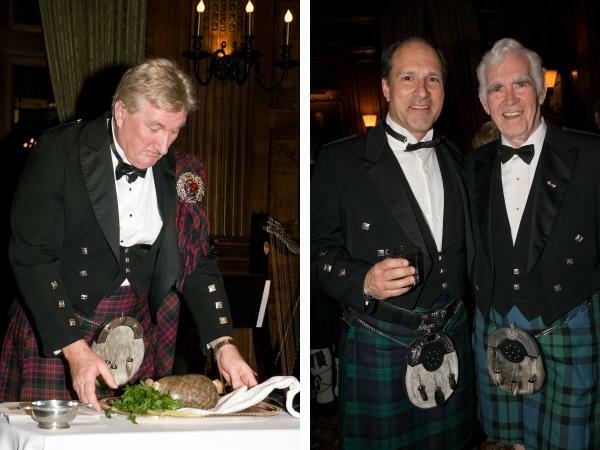 On Friday, January 17, the American-Scottish Foundation held its 19th Annual Burns Celebration in association with the University Club, New York. With over 250 people in attendance the evening was awash in tartan, bagpipes, haggis and reels as Scotland’s Bard was celebrated with music from Maureen McMullan and Mike Ogletree and the wonderful sounds of Hannah Read & Friends with their unique blend of Appalachian and Celtic Root music. Kenneth Donnelly delivered a rousing Address To The Haggis, with great theatrical gusto. The procession was led by Andy Hamilton of the New York Pipes and Drums with the Chef Bagli, David McNicoll and the Stone Family completing the presentation. ASF would like to thank WIiliam Grant USA for the Balvenie whisky tasting. This entry was posted in ASF Events and tagged Burns Night, Burns Supper on January 21, 2014 by Camilla Hellman. 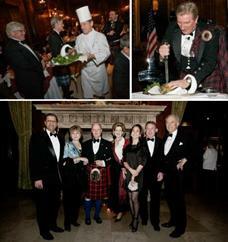 The American Scottish Foundation is holding its 19th annual Burns Supper in NYC tonight. Recently we spoke with Alan Bain, Chairman of the ASF, about this evening’s event. What is the history of the ASF’s Burns Supper? Our Burns Supper started in the early 1990’s. I was head of the American-Scottish Foundation, and also on the board of a private club. The club management was noting the absence of social activities in the dead of winter, and I remembered my father, a Scot and a great Burns fan, talking about Burns Suppers. I suggested they might enjoy hosting a Supper in conjunction with the ASF, and so it began. Our first Burns Night Supper was in January 1995. The foundation is about to host its 19th dinner. There have been a few fundamental changes – for example, many in our audience are not familiar with Robert Burns, and an in-depth lecture for the “Immortal Memory” may be too cerebral. Also, some Scots’ accents were too difficult for American ears! [laughs] But the audience really enjoys Burns’ music and words, so we have had skillful performers act out such works as “Holy Willie’s Prayer” and “Tam O’Shanter.” These are greatly enjoyable. We also often have the “Toast to the Lassies” and “The Lassies’ Response” sung using Burns’ songs, the toasts concluding with duets. Over the years, the music has become less operatic in style and more country/folk. Recently, we have enjoyed Alyth McCormack from the Isle of Lewis, Fiona Kennedy from Aberdeen, and Phaime Gow from Edinburgh. We’re delighted that Maureen McMullen and Mike Ogletree are returning this year to perform the toasts. What is particularly successful about the program is the partnership between the club and the ASF, resulting in attendees from both groups. We also welcomed women at a time when several Scottish-American societies were men-only. We pick an early date for our dinner as there are several Burns Suppers in New York City, and this enables local Scots to attend more than one. And over the years, we’ve continued to encourage our members to bring new people, introducing them to this great tradition. The evening is a celebration of Robert Burns in true Scottish style. We will have over 250 guests joining us, many returning each year. The setting we have heard described as “the nearest one can come to a Burns celebration in the Highlands,” a grand paneled dining room in a landmarked building designed by a Scot. Guests are greeted to the strains of the Foundation’s piper and enjoy a whisky tasting reception before being piped into dinner. Once seated and Grace is said, the music begins, performed by Maureen McMullen and Atlantic Seaway, Then it’s time for the ceremonial Haggis procession, where it is carried into the room by the chef, the piper, the whisky bearers – it’s a lot of fun. The “Address to a Haggis” is a key element of the evening, and will be performed by Ken Donnelly. Originally from Glasgow, Ken is a banker, a former board member, a member of the Burns Society, and great orator – his delivery is dramatic, clear and compelling. During dinner, there are short introductory remarks about Robert Burns, his reputation and the celebration of his life occurring around the world. Ambassador Uden will bring greetings from the British Consul General; Alfred Bissett, former president of the St. Andrew ‘s Society of the State of New York, will give the Toast to the Queen; Darren Burgess, Second Secretary, the Scottish Government, will bring greetings from Scotland; and John Booth, Head of Marketing, the Scottish Government, will give the toast to the President. The musical toasts will be followed by the Reels (an energetic set of Scottish dances led by Hannah Read) and the drawing of the Winter Raffle, bringing the formal part of the evening to a close. The bar stays open and the dancing continues until 11:00pm. Why is it an important gathering for the Scottish community there? Scots around the world have a deep love for Robert Burns’ music and poetry, and especially his themes of humanity and compassion. When the holidays have passed, and spring is far away, it’s wonderful to be able to get together with family and friends, celebrate his spirit, and feast and sing and dance. The success of the evening comes from a mix of the audience, their enjoyment, the opportunity to celebrate Burns’ memory, and being part of a cultural tradition that is being shared around the world. What are the future plans for the soiree? We recently discussed this with several of our members, and they did not want us to change anything. So for now, I expect that the evening will continue in much the same vein – keeping it fresh and with new musical talent. The Reels are a growing element and have added considerable vitality to the evening. What else does the ASF have on tap for the coming months? 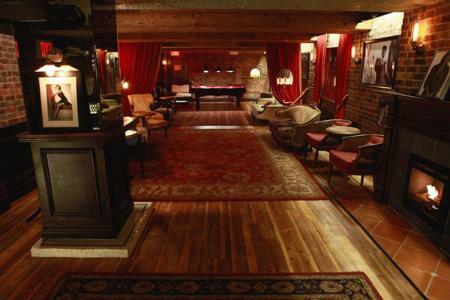 On February 25th, we have a New Member Night at a wonderful spot, Cafe Tallulah. Then on March 19, we’ll be heralding the arrival of the Kelpies to Bryant Park in midtown Manhattan! 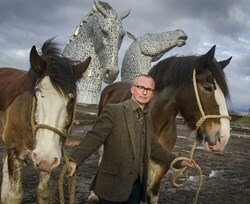 These are two 15-foot-tall scale models of Andy Scott’s massive 100-ft. horse sculptures. They will be on display for a month, making Bryant Park a center for the celebration of Scotland in New York, and connecting with the formal opening of the Helix Project with the full-size Kelpies in Falkirk, Scotland. The rest of February and March will be devoted to preparing for Tartan/Scotland Week (now up to two weeks) in April. For the ASF, 2014 is going to be a landmark year. We are involved in events not only in New York but also in Washington, DC. For example, Ross Gillespie and Tricia Malley, award-winning photographers from Glasgow, will have an exhibit entitled “As Others See Us” at POP International in the Citicorp Building. The exhibit consists of portraits of well-known Scots incorporating lines taken from their favorite piece of Burns’ work. The ASF is a founding member of the National Tartan Day New York Committee, and continues to work organizing the Tartan Day Parade in New York City, coordinating events that week, and assisting the Scottish Government in implementing its plans to bring its tourism and Homecoming messages to an American audience. This entry was posted in News and tagged Burns Night on January 17, 2014 by Mark Beaumont. ASF would like to introduce you to one of of our new members, Dunmore Scotland – our new members, to Dunmore Scotland – a vibrant new fashion label producing striking bags and accessories. Inspired by Scotland and made exclusively in the UK, each and every collection is crafted to guarantee outstanding quality of craftmanship. Dunmore’s vibrant collection feature a range of ladies’ and mens bags, silk scarves and iPad covers. Putting a contemporary twist on heritage fabrics, such as Harris Tweed and Tartans. The ASF Winter Raffle which will be drawn at our Burns Night Celebration is your chance to win The Kelso bag from Dunmore, a $425 value… Tickets are $20 each – 7 tickets for $100. For details on the raffle and to purchase tickets download the form on the ASF’s main website. and fax to ASF on 212 605 0338. This entry was posted in Business, News and tagged Dunmore, raffle on January 16, 2014 by Mark Beaumont. offering special privileges and discounts to ASF members. This entry was posted in Business, News and tagged Brooks Brothers, discounts, offers on January 16, 2014 by Mark Beaumont. And if you are not yet a Member and Join Now your evening at Cafe Tallulah is free!! Otherwise reserve using our secure Paypal facility, below. We’ll be holding a Raffle with exciting prizes! Tickets are $10 each or 12 tickets for $100, and may also be purchased using the form above. This entry was posted in ASF Events and tagged Cafe Tallulah, Member Event, Membership on January 15, 2014 by Mark Beaumont. Bryant Park, in New York City, will welcome two 15 ft tall scale models of Glasgow-born artist Andy Scott’s ‘The Kelpies’ sculptures from March 19th to April 22nd next year, in the lead up to the internationally acclaimed week of Scottish celebrations in the city. One of the world’s highest profile public spaces is to showcase a major new arts project which is set to transform Scotland’s tourism map. Bryant Park in New York City, will welcome two 15 ft tall scale models of Glasgow-born artist Andy Scott’s ‘The Kelpies’ sculptures from March 19th to April 22nd next year. The Kelpies – two 100ft steel horses heads which are the largest equine sculptures in the world – are the centre piece of the £43 million Helix land transformational project between Falkirk and Grangemouth in central Scotland and are expected to attract an additional 350,000 visitors a year to Falkirk – a town just 30 minutes’ drive from Glasgow and Edinburgh. 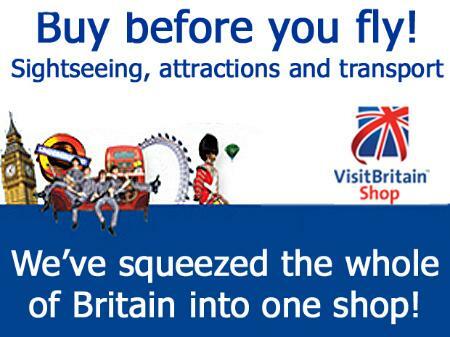 They will also boost the central Scotland economy by around £1.5 million per annum and provide the area with its second ‘top ten’ UK tourist attraction. The Helix will transform under-used land between Falkirk and Grangemouth into a thriving urban green space. Once complete, it will be an outdoor recreational area open to all, offering easy access to picturesque woodland, a central park with a lagoon, linked walking paths and cycleways. Thanks to terrific support from The City of New York Parks and Recreation, Bryant Park Corporation, and the American-Scottish Foundation®, the scale models (known as the Maquettes) will be seen by more than 250,000 people a day during the period they are on display next spring. In addition, a program of lunchtime concerts is being planned around the sculptures on Bryant Park’s Fountain Terrace as part of next year’s celebration of Scottish arts and culture in the heart of Manhattan. 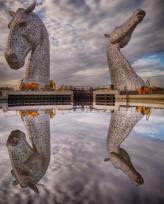 “The Kelpies pay homage to Scotland’s heavy horses which played a vital role in agriculture and industry in Scotland. They exemplify the best of creativity, engineering and project management and are soon to be the largest public artworks in the country, and the largest equine sculptures in the world – they have been almost eight years in the making. The Maquettes have previously been showcased in Grant Park in Chicago, Illinois, as well as Scotland’s capital city Edinburgh. The Helix development is being driven by a partnership of Falkirk Council and Scottish Canals and the construction phase for the 100 ft. tall Kelpies was completed in November 2013. Work on the site’s visitor and parking facilities is currently underway and the development will officially open to the public in the summer of 2014. A spokesman for The Helix team said the unique agreement with the Bryant Park Corporation was a major development for The Kelpies and for Scotland. He said: “New York City is said by many to be the cultural capital of the world, and so this unique opportunity to position The Kelpies as an International sculptural landmark and visitor destination represents fantastic recognition for the project, raising awareness of the beneficial impact it will have on the local area and on the whole of Scotland. “It is a huge gesture of approval for The Kelpies to be chosen for this venue and a true accolade for the sculptures and The Helix. I hope that some of the thousands of people who see these sculptures on display in Bryant Park will take time in the future to visit The Helix if they come to Scotland. The Kelpies’ arrival in Bryant Park is a partnership between the Helix Project, The City of New York Parks and Recreation, Bryant Park Corporation, and the American-Scottish Foundation. Bryant Park is a 9,603 acre public park, privately managed by the non-profit Bryant Park Corporation, located in the New York borough of Manhattan. 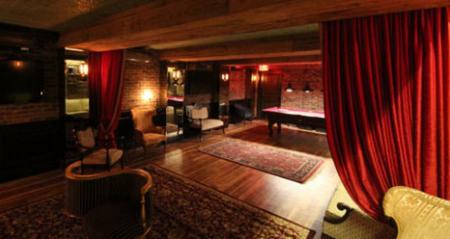 It is located between 5th and 6th Avenue and between 40th and 42nd streets in mid-town Manhattan. Tel. +00 44 141 221 0707 or +00 44 7825 153 599. Tel. +00 44 141 221 0707 or +00 44 7725 638 246. BRYANT PARK CORPORATION: Bryant Park Corporation (BPC), a not-for-profit company, was founded in 1980 to renovate, finance and operate Bryant Park, one of the busiest public spaces in the world, without government or philanthropic funding. In addition to providing security and sanitation services, and tending the lawn and seasonal gardens, BPC creates amenities and activities in Bryant Park for over 5 million visitors each year. BPC’s website http://www.bryantpark.org/ has more detailed information plus a complete schedule of the upcoming wide range of free events. THE NEW YORK TARTAN DAY PARADE: The New York Tartan Day Parade will take place on SaturdayApril 5th, stepping off at 44th and Sixth Avenue, two blocks north of Bryant Park and The Kelpies. In 1998 the U.S. Senate declared April 6 to be National Tartan Day to recognize the contributions made by Scottish-Americans to the United States. In 1999, two pipe bands and a small but enthusiastic group of Scottish Americans marched from the British Consulate to the UN—our first Parade! Since then, it has grown to include hundreds of pipers, thousands of marchers and many more thousands cheering from the sidelines. This entry was posted in ASF Events, Scotland-Tartan Week and tagged Andy Scott, Bryant Park, Falkirk Council, Kelpies, Scottish Canals, The Helix on January 9, 2014 by Mark Beaumont. This entry was posted in News, Travel in Scotland and tagged London, sightseeing, travel, UK, Visit Britain on January 9, 2014 by Mark Beaumont.